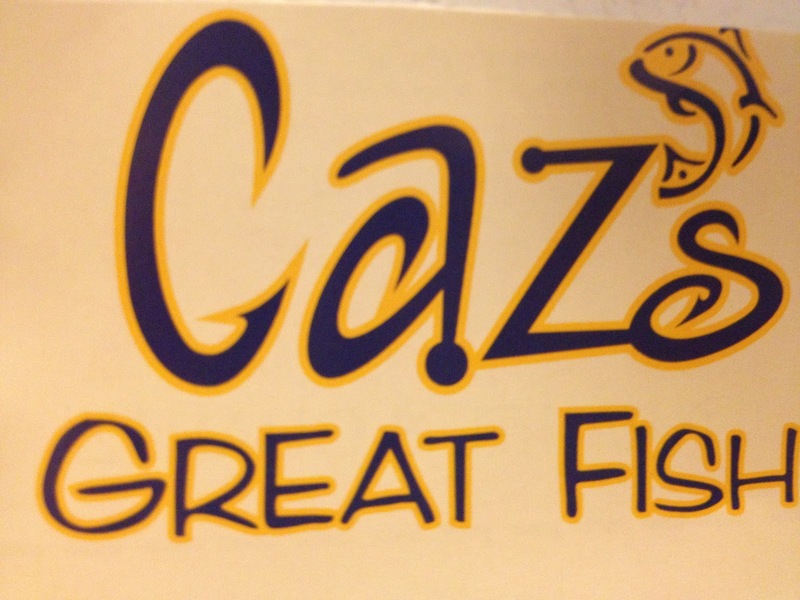 Home / Cambridge / Caz's GREAT Fish! Reservations: No soup. No really, it's fish and chips. It was a glorious day in Cambridge. 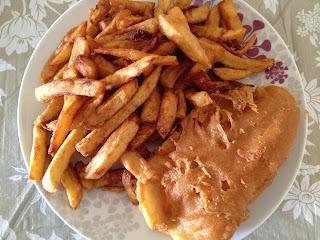 The sun was shining....The birds were chirping....and I had a hankering for fish and chips. 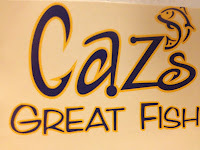 While running errands I spotted it, Caz's, in all of its fishy glory and from that moment I knew I was catching dinner there! I was by myself on this wonderful day of ME TIME, so I called ahead to order halibut and chips for take out. This is always a good test for restaurants. Will the food be cold? Re-heated? Fresh? I told them I would be there in 20 minutes. Upon my arrival, I was greeted by cheerful staff and a large bright seating area. There were about 25 tables. Unlike many restaurants that do takeout, my order was not packed and waiting for me. When I gave them my name for the order, they then prepared it infront of me. Now that's fresh! The fries and fish had just come out of the fryer. Perfect timing. The cook asked if I wanted malt vinegar and tartar sauce. When I told him it was illegal not to, he placed a healthy handful of each in my bag. When I arrived at home, it was still too hot to eat. I still managed to scarf down a few chips while I put my meal onto a plate. Malt vinegar and tartar sauce in hand, I ventured to the balcony to eat in the sun. As someone who's grew up loving halibut and chips, I've had some great and crappy fish. This fish was great. The batter was a little thicker than I like, but it was light and it was not trying to disguise the thickness of the fish, like SOME places do. The fish was over a quarter inch thick. I was giddy. As you can see from the size of the fish, I didn't eat many fries. I don't think I could've eaten all of the fries alone! The fries could use some work. I added some salt and malt vinegar and they were just ok.
Would I go back? HELL YEAH! Because it's about the fish, not the chips!